Ok, so whilst I get back into the swing of taking pictures, I am on a quest for a birthday dress (December 8th, all gifts welcome), nay, I am on a quest for THE dress. Everyone that knows me, knows that the majority of my clothes fulfil one of two criterion; is it black? Is it somehow sheer? THE dress falls into both of these categories and yet for the past 2 years, the gown gods have been conspiring against me and my dress plans keep being thwarted. I bought her and wore her, only to have the bottom half (which was made out of velvet) completely fall apart whilst I was at the restaurant - obviously my life is just tragic like that so I cried internally then returned it to asos. Now, the time has come again and I keep seeing celebs wearing variations of my dress. Short of having a tailor make it for me, I am quite frankly at a loss, so I need your help. Should you see any dress akin to the above or below, take a picture and send it to me INSTANTLY. I have less than a month to buy it - wherever it may be. A million eyes are better than one, so be my eyes people. Cheers and thanks. 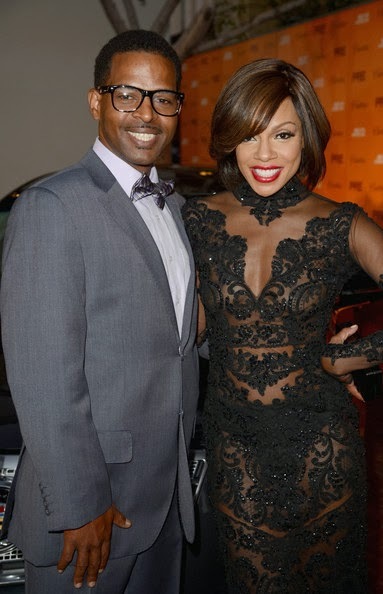 I love me some Tasha Mack (Wendy Raquel Robinson) but WHY is the heifer wearing my dress?